When choosing the best scope for your rifle, keep in mind that a precision rifle can only be as accurate as the sighting system. Today we are going to discuss the topic of rifle scopes, and how you should approach the selection and purchase of a rifle scope for your Desert Tech rifle, or any rifle. 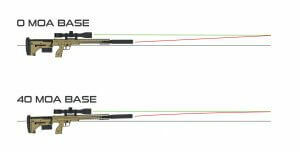 Telescopic Rifle Sights have been the norm for many years now when it comes to precision rifles. When shooting very small or distant targets, it is hard to match their accuracy. With such a saturated market, choosing an optic from the abundant options actually favors you the buyer into getting exactly what you need or want. We’ll start with some of the criteria you’ll need to outline before you ever put hands on any glass. How much can/will you spend on a scope? What shooting activity will you be doing, and what features will you need for it? You cant shoot something you cant see in definition. How tough an optic do you need for the intended service? Will the manufacturer stand behind their product? 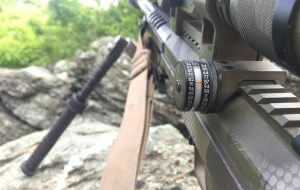 Rings, mounts, and bases are important accessories to a good rifle scope. Should I Buy a Scope or a Rifle First? Some people wait until they have purchased a rifle before they start thinking about a rifle scope, but you would be better served by doing all your research beforehand. Of the criteria listed above, I believe features and purpose to be the first priority. Once you have those details defined, it will serve as a guide for the rest of your criteria. One of the most important things to consider when deciding on an optic is its intended purpose. If you are a Police Sniper, then your tasks may differ greatly from those of a target shooter, but might not differ too much from a hunter. 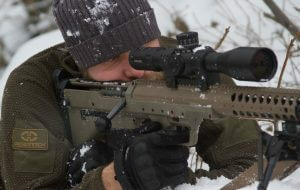 You need to have a good understanding of the type of shooting you intend to do, for example; will you be shooting close? Inside 200-300 yards? Or will you be shooting long range, out to six hundred yards or more? For most people shooting less than one thousand yards a 3-12 or 4-16 magnification range will do just fine, but there is nothing wrong with having more X’s either. If you have less than perfect eyesight, you may want a high magnification scope regardless of how far you are shooting. 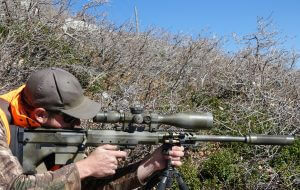 Many folks use scopes in the 6-24 or 5-25 range for those same distances, it depends on your eyes, and your preference. Another point to consider in your shooting is the conditions, if you plan on hunting with your rifle then a massive 5-25X56 scope may be more than you want to carry around through the mountains. Perhaps a more compact scope such as a 2.5-10X42 will fit your needs better in that scenario. Also, if you are going to be using the rifle for hunting, you’ll want to ensure that it has the attributes that best serve your needs. Some of those could be the reticle style, do you need a holdover? Or will a duplex do just fine? Do you want/need exposed turrets for adjustment in the field? Will it survive in the cold and wet weather? Bouncing around on an ATV or truck? Once you have your purpose specified, then you can focus on getting all the best features that you want or need. That could be compact, light, and robustness for a hunting scope. Or it could be a large tube for maximum internal elevation, and a front focal plane (FFP) milling reticle if you are a competitive shooter. With so many good options, you really should look at them all before making a choice. Some features deserve more discussion, due to their complexity. For many years, there were only a few things to consider, such as magnification range, objective lens diameter, tube size and couple other things. Today’s scope lineup has many different features, some of which are new to many shooters. So we’ll address some of them here, just to help give a better understanding, and hopefully, help those who are looking. What is The Difference Between MOA vs MIL? MOA – Minute Of Angle is an angular measurement used in optical devices. Angular measurements are like a cone shape, with the smallest end of the cone at the observer, and the open end expanding as it gets further from the observation point. So imagine you are at the range looking through your scope at 100 yards, one Minute Of Angle (MOA) at your 100 yard target is 1.047 inches. As you look farther away at the two hundred yard target your one MOA cone has opened up to 2.094 inches, and as the target gets farther and farther away, it will continue to grow in diameter. Rifle scopes use MOA measurement to adjust elevation and windage to compensate for bullet drop, or wind. So if your bullet drops 8.5 feet(102″) at 500 yards, then you can correct for it by dialing up 19.5 MOA (1.047X5=5.235) 102inches÷5.235= 19.48 MOA) MOA rifles scopes usually have turrets setup in 1/4 MOA clicks, but sometimes other values such as 1/8 MOA clicks are used.In this graphic, you can see that at both ends of the cone comprise of a one MOA circle, but at 1000 yards, one MOA is 10 inches, whereas at 100 yards, it is only one inch. Also you can see, that if your bullet impacts are hitting at the bottom of the circle, you can dial or hold over one MOA and the bullets will then hit at the top of the circle. MIL/MRAD/Milradian all mean the same thing, MIL and MRAD are just shortened versions of Milradian, which is another angular measurement. MOA and MRAD are two different values for the same measurement. To make a very simple comparison, inches are to MOA what meters are to milradian’s. They are simply two different values to measure the same thing, just like twelve inches is equivalent to thirty centimeters, one MIL is equivalent to 3.438 MOA. So at one hundred yards we said one MOA is 1.047 inches, but if you use the MRAD value, one inch at one hundred yards is .36 MRAD. So the MIL/MRAD scale is a little more coarse, but they both do the same thing, they measure angular values. MRAD rifle scopes are usually setup with 1/10th (.1) mrad clicks on the turrets. Some folks like using quarters and halfs of the MOA scale, some people like using the base ten model of the MRAD scale. Either one will work fine as long as you understand what you have. When buying a rifle scope, get whichever one you feel most comfortable with, there is no wrong answer. Except this one: for some reason, in the past most scopes were manufactured using both units of measure in the same scope. They came with a MRAD reticle, and MOA clicks on the scope turrets. Unless you love doing math in your head on the fly, then stick with scopes that have matching reticle’s and turret’s, MOA/MOA or MIL/MIL. Reticles have advanced tremendously over the last few decades. There was a time when a simple MIL dot reticle was the best you could hope for. But today’s market is flooded with fantastically complex and simplified reticles. 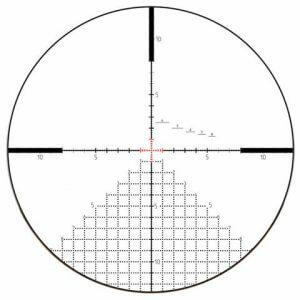 The purpose of a “milling” type reticle is to give the shooter multiple points of reference when looking through the scope, most reticles use the same values mentioned above. Using MRAD or MOA values, they are like a ruler inside your scope, allowing you to measure come ups, target size, wind holds etc. With holdover points, as well as windage reference points, a shooter can quickly compensate for distance, wind, spin drift, or any other external or downrange force. Reticles can also be used to measure distance, using known values and reverse calculating the distance to target. 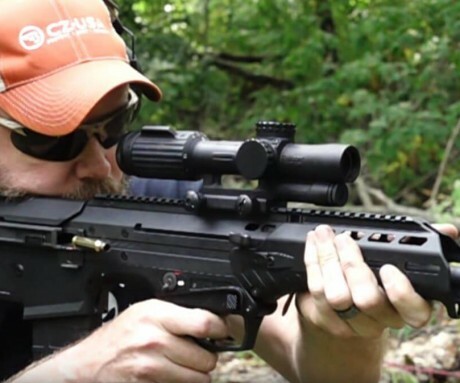 Some are quite complicated while others are incredibly simple, find one that fits your shooting style, and learn how to use it. Another modern feature of today’s rifles scopes is FFP vs. SFP. First Focal Plane (also called Front Focal Plane) scopes have the reticle located in the first focal plane of the telescope. By locating it there, the reticle is part of the image that is magnified when you zoom in, the reticle grows or shrinks depending on magnification. The result is having the reticle always proportional to its actual value (either MOA of MRAD) regardless of the power zoom setting on your rifle scope. One MIL is always one MIL in your FFP scope. Second Focal Plane scopes have the reticle located in the secondary plane of the telescope, most older scopes were built this way. That means that no matter what magnification your scope is set on, the reticle will always remain the same size. The shooter must keep this in mind when using the reticle for any activity where the value is critical. Most SFP scopes are calibrated to be accurate at maximum magnification, that means that for your reticle to read right the scope must be at its highest zoom setting. You can counter that by again doing quick math in your head, for example; if your reticle shows 1MIL at 24X, the same measurement at 12X will be double that amount, so 2MIL. As you can see, technological advances have made things easier by removing the need to do math while your trying to squeeze the trigger. Now that you have evaluated your purpose, and the features you need or want for that purpose, you should have a good idea of where to start looking. You also will be able to evaluate how much you may need to adjust your budget. Usually our wants exceed our needs, so while we all may want a super car, a family sedan will certainly get the job done. Finding the best scope for your money can be a similar exercise. In order to stay in your budget, you may need to forgo one or more of the features you desire. For example, if you want top of the line optical quality, you are going to have to pay for it. But you may be able to find a more economical option with the same mechanical features but perhaps with a slightly lower grade of lens in it. Or you might be able to get the best glass available, and go without some of the other bells and whistles and stay within your budget restraints. How Much Should I Spend on a Scope? There are many out there that say you should spend double the price of the rifle on your scope. That may be a good idea if you are buying rifles in the $500 to $1000 range, as it will likely give you a good gun/glass ratio. But if you are buying rifles in the $3000 to $7000 dollar range, spending twice that may be both unreasonable and unnecessary. Some of the best rifle scopes available today can be had for two to four thousand dollars.For most people, top-tier optics are neither necessary nor an affordable option. There are good scopes that can be had for $1000 or less, the downside to that is that you get what you pay for. Many of the lower end optics lack either the most popular scope features (reticles, turrets, FFP, illumination,etc) or, they lack something in optical quality. Depending on your eyes, and your activities, this may not be a problem at all. Paying just a little more for your scope will likely be something you will be glad you did. Getting what you paid for is very satisfying, and it will help you maximize the ability of both you and your rifle. Under-spending on a scope will likely leave you wanting more. Most people who buy more scope than they need, end up being happy with their decision. Those who buy less scope than they need end up with buyers remorse, wanting a better optic but now stuck with something that represents a large investment, but doesn’t perform to the owner’s expectations. I grouped these three things together because they are all related to one subject; the reputation of the company that manufactures optics. There are many great companies in the world today making rifle scopes, far too many to list here. The internet and its many forums make it quite easy to research these companies, their products and especially their reputation. Top tier optics companies are well known for their quality, and taking care of their customers. Some of them even step up and take care of their customers even when their warranty policy doesn’t require them to. Other companies have warranties that are so accommodating that it doesn’t matter what you do, they will take care of you. It’s worth repeating again, you get what you pay for, particularly with optics. There are many cheap optics companies out there selling scopes that appear to be a great buy, but beware. If it looks too good to be true, it almost always is. There are even cheap Chinese built counterfeits that are almost perfect clones of quality American made models. The quality, robustness, and durability of a scope directly correlate with their price. That doesn’t mean you need to spend a months salary on your rifle scope, just know that if you spent five hundred dollars, you cannot expect it to go head to head with a three thousand dollar scope year after year. As long as you understand that, and the limitations that come with it, you should be fine.. Proper mounting is as critical as the scope itself. A poorly mounted scope could cause damage to an expensive optic, or cause it to malfunction. The recoil of a rifle is no insignificant thing, and the heavier the recoil, the more important it is to make sure you have a solid scope mounting solution. At minimum an incorrectly mounted scope will not function properly. The rings, bases, and mounts you mount your scope in should be of the same quality and grade as your scope, check your scopes owners manual or manufacturer website for recommendations. They usually manufacture their own rings or mounts, but if they don’t you should make sure you get something of equivalent quality and performance. Always make sure you have the right size and height for your scope, there are one inch, 30MM, 34MM, and 35MM tubes. This may require pre-fitting at the gun shop, to make sure your scope is at the right height, eye relief, etc. 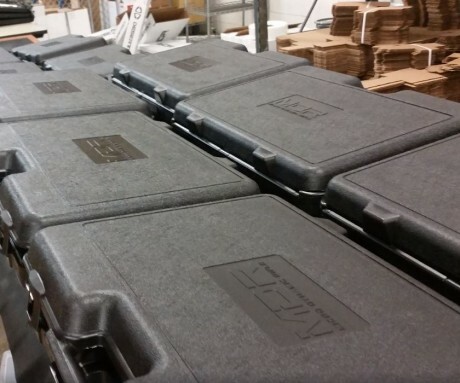 Pre-fitting is always a good idea, to make sure all your components are compatible and will allow proper clearance. Many manufacturers are making one piece scope mounts, it incorporates both rings into one piece. The reason is for a stronger, more consistent hold on your scope. There is nothing wrong with using any of these options, as long as your scope is held properly and securely. There are mounts, rings, and bases made of steel, aluminum, and other materials, make sure you get one that will stand up to the conditions you anticipate using them in. 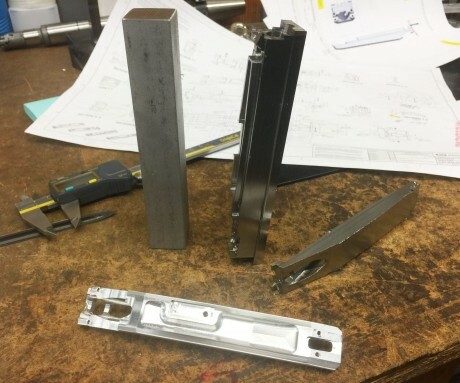 Another thing to consider is many scope mounts and bases are manufactured with built-in cant. You can purchase mounts and bases with 0MOA, 20MOA,30MOA, or more built right into them. The purpose for this is to give long-range shooters more versatility, the built-in cant allows them to zero the rifle with the scope’s erector as close to the bottom as possible. This allows the maximum internal elevation come up using the scopes adjustable turrets. Being that there are so many great options, it’s hard to give a recommendation. So what we can do is break down choices by price range. Obviously with some of the small details such as reticle options, colors, or any other characteristics you can decide yourself. The Hensoldt ZF 3.5-26X56 Is at the top of the optics pyramid, and if you can afford it, you certainly don’t need to hear my opinion. Tangent Theta Also makes some of the best rifle scopes available today. And the reticle options and quick re-zero feature make them Ideal for Desert Tech multi caliber rifles. Any of the Schmidt & Bender PMII series of scopes would be a good choice for a precision rifle. 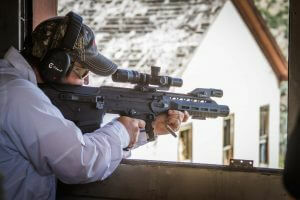 TheVortex Razor is extremely popular among distinguished marksmen. 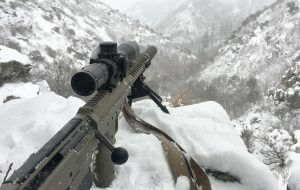 Kahles 624i also is an excellent choice in optics. And they feature our own Advanced Milling Reticle (AMR). The US Optics B17 and B25 rifles scopes are also excellent choices for your precision rifle. The Nightforce ATACR 7-35X56gives incredible magnification range for those really long shots. There are many great options in this price range, with offerings like the Nightforce ATACR in various magnification ranges like 4-16 and 5-25. Steiner makes a 3-15 and 5-25, that would make a great companion to your precision rifle. One of the newcomers to this market is Sig, and their new line of Tactical riflescopes is very impressive, with many different options to choose from. They have a model for every need. 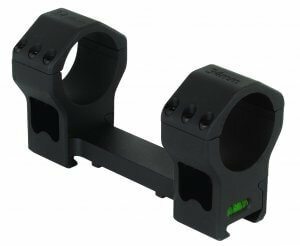 The Gen1 Razor HD from Vortex Optics is another great option that doesn’t cost quite as much as the Gen2. Bushnell makes some great scopes towards the top of this price range, the XRS and ERS lines of scopes are perfect for a precision rifle. As we come down the pyramid of optics, there are more and more options, but be careful to stick with well-known manufacturers. Many of the same players we’ve already mentioned make great scopes in this range as well. The US Optics B10 is a great option in a lower magnification range. Vortex again offers an amazing spread of scopes with their Gen 2 PST line, with options in 5-25 and 3-15. The Bushnell HDMR fits nicely in this category and gives great reticle options if you need them. The Nightforce NXS have a long established history of bulletproof service, and they have several models that can be had in this price range. Burris has a very broad spectrum of scope in their XTR II Line with scopes from 2-10 up to 5-25 and some very nice reticle options as well. We already mentioned Sig Electro Optics, but their Tango 4 line of scope fit in our list again with a 2-12, 4-16, and 6-24. SWFA is a great place to buy anything scope related such as mounts, rings, and accessories, but they also make a great riflescope that fits in our list. The SS 5-20 HD has a great reputation. Many people think that there are no good choices in this range for a high-end precision rifle. While it may not be my first choice, there are still some valid options to be had. Again Vortex shows up with a great selection from their PST line of scopes, both in 4-16 and 6-24. Their Viper HS line is also an option. The Sig Tango 4 3-12 is another great option for under a thousand dollars. Some of the Nightforce SHV Scopes can be had for under a thousand as well. The SWFA SS 3-15 is another good one that won’t break the bank account. Bushnell also makes some less expensive scopes in their Elite Tactical line, and many of them fit into this range. There are many more options out there, these are just ones that we have experience with and would recommend.